The free version of the ReadPlease software was published in 2003. It is a very simple program on the surface but what it actually allows you to do is hear what is written on the screen. The program speaks aloud the text that is pasted into the tool. The ReadPlease 2003 free edition has a space in the middle of the GUI that looks like the Microsoft notepad tool. Paste your text into the middle of the white area. 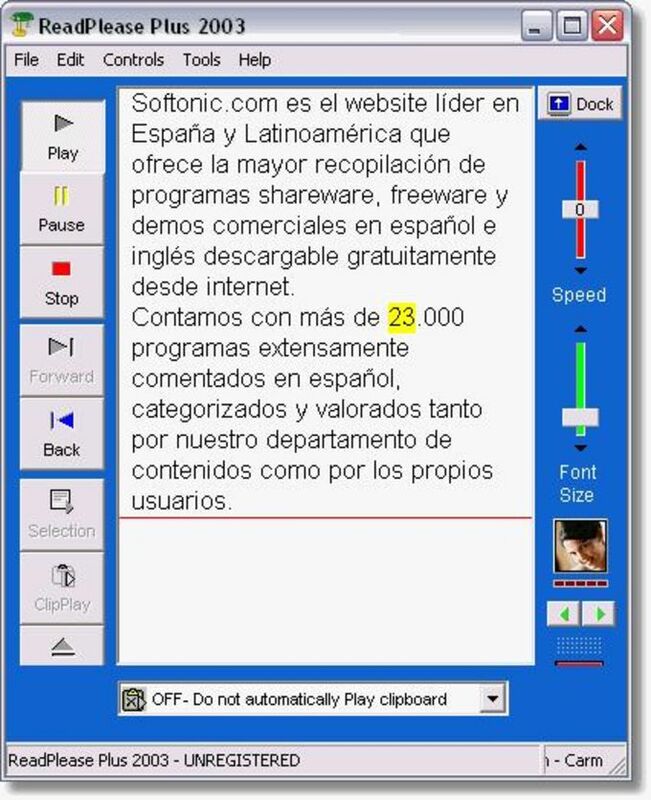 Click to start the program and it will read out the text by highlighting the words as they are being spoken. There are plenty of reasons why you may want your text read out to you - from eyesight problems to having a document read to you as you play games on your PC. The extra functions on ReadPlease are insignificant but do add a level of comfort to the program. For example you may change how quickly the text is read and how large the font is. You may choose between two male voices and a female voice and you may have the text read aloud automatically when you paste or you may have it read only after you have clicked play. As someone who took up Linux in 2002, and stopped using Windows entirely a few years afterward afterward, the strongest recommendation I can make is that this is the only software I ever paid money for. I bought the licence for the premium version for 40 dollars, and I was happy to do it. I haven't used it in a while, but in April 2019, I downloaded it from my Dropbox, and I'm running it from Ubuntu 18.10 using the Windows Emulator WINE. So far, it's running without a snag. I intend to use it to study the Mueller Report. The version I'm using is the Trial-Pro version. Even though I paid for the password, I lost it, and so after the 30 day Trial version is up, I may need to reinstall WINE. READPLEASE is easy to use, and without its help, years ago, I may never been able to study those book years ago to learn how to use Linux. (I have an English Degree. computers were not my thing.) The simple interface scrolls through the text, making it easier to follow and comprehend difficult material. It was worth paying for the Premium version all those years ago, but I can report that the free version is useful and effective. What do you think about ReadPlease? Do you recommend it? Why?